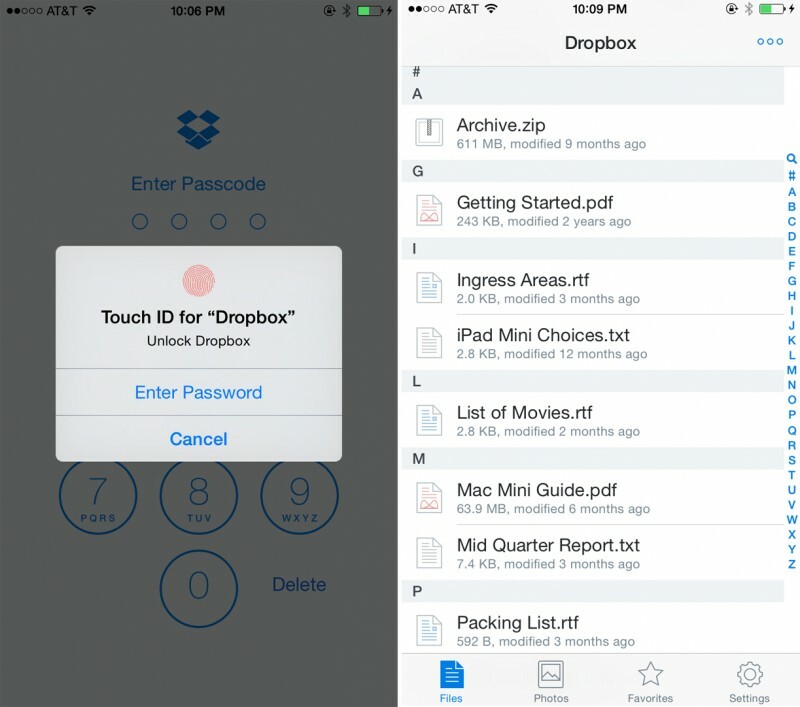 File-sharing service Dropbox has updated its official iOS app with a number of new features, including full optimization for the iPhone 6 and 6 Plus as well as integration with Touch ID for more convenient unlocking. The app also includes a fix for previewing rich text format files and general stability and performance improvements. Dropbox saw its last major update last month after the release of iOS 8 which brought a new Notification Center widget, a new Share extension that allows files from other apps to be opened and saved, and the ability to manage shared folders in the app. A number of other apps have also included support for Touch ID since the release of iOS 8 last month. Now that it is clear that Apple created a lackluster iCloud Drive implementation (on iOS), Dropbox is still needed unfortunately. Thanks! Keep the 6 Plus optimized apps coming! Completely shifted to iCloud now, don't want those DropBox hacks to have my files. The recent Dropbox security issue was a third-party company that allowed users to login using their Dropbox credentials. Dropbox's systems were not breached. I am a long-time Dropbox paying customer and I still rate them as #1 at what they do. I also wouldn't trust Apple to look after any of my personal data, particularly my important files & documents! Absolutely no chance in hell. I can't seem to find the way to set Touch-ID to work in DropBox, is it working for anyone? I just updated the app on my 6. It's in the Passcode lock section under settings. There should just be a radio button that you switch to on. A few hours ago I literally just rededicated myself to using Dropbox as my cloud solution once I realized how bad iCloud Drive is. C'mon, DropBox been around since 2007. Apple's cloud service is about 2 years old. Give it time. Just 2 years? Not really. iCloud is the successor to Mobile Me which was the successor to .Mac which was the successor to iTools which dates back to 2000. Apple, pay attention to Dropbox. You might learn something about Cloud Done Right. Simple. Powerful. Easy. Intuitive. Versatile. Scalable. Dropbox even lets you publish your iWeb websites. Remember that, Apple? When you empowered people to create and share content, rather than just consume it? Love Apple but Dropbox is more Apple-like than iCloud. Still the best cloud provider followed by Google Drive. Not sure what Apple was thinking not releasing a dedicated app for this. iCloud Drive is a bag of hurt. I was just reminded from another post that iCloud was rumored to be based MS Azure. No wonder 3 years later and it is still unreliable and hard to work with. I had a iOS 8 app ready to go, but Apple created new iCloud containers and the old containers were just simply abandoned, unless you hand edited some plist files. Even with that no Apple docs about it, no support in Xcode 6, nothing. I have abandoned iCloud for iOS apps and will be migrating everything to other services included Dropbox. Isn't that what happened with 1Password?